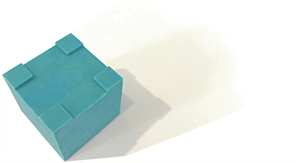 The P22 Blox are made from space age material—plastic! They allow for a wide variety of lettering, experimental letterforms and pattern making, giving printers an entirely new medium to inspire modern presswork. These Blox are now available individually so you can get a few to test out, supplement your existing set, or even build your own mini set. These individual sorts are from the 2nd casting and will be in the original aqua color, but they still print exactly the same. There are positive and negative shapes for overlay options. P22 Blox contains enough variants to form any letters, numbers or abstract patterns. Blox features tight edges so the solids (both positive and negative sets) can be locked up as continuous artwork,as is the intention of wood type ’streamer’ fonts. Standard 6-line furniture and spacing can be used for additional lockup. Each block is 1" x 1" x .918" with a tolerance of +/- .003 inch. The Blox are injection molded in Upstate New York using Thermo Plastic Elastomer (TPE). Read about P22 Blox development via our Kickstarter page. See how printers are using P22 Blox at our Pinterest Gallery. Order single Blox at P22 analog site.